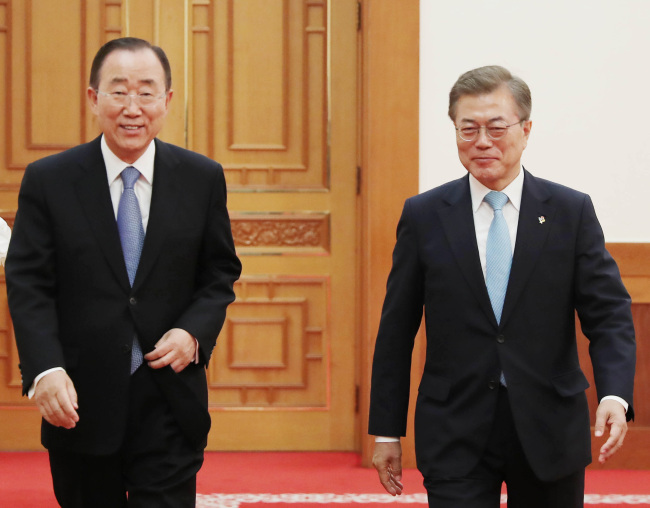 President Moon Jae-in on Friday met with former United Nations Secretary-General Ban Ki-moon, seeking the former top diplomat’s advice on the upcoming summit with US counterpart Donald Trump. This was Moon’s first face-to-face meeting as president with the former UN official, who was briefly considered the most likely conservative presidential contender in the lead-up to the election. “Diplomacy is an urgent issue at hand and I hope that you share your experience and wisdom (with us),” Moon was quoted as saying by Cheong Wa Dae spokesperson Park Soo-hyun. During a closed-door luncheon, they addressed key national security and diplomatic issues, focusing on North Korea’s nuclear armament and the Terminal High Altitude Area Defense anti-missile system. Details on what they discussed on the THAAD issue will remain confidential for national security reasons, the spokesperson said. The meeting, which was held with only spokesperson Park in attendance, was planned to end at 1 p.m. but was extended by some 50 minutes. Although the Blue House declined to comment in detail, there were speculations that President Moon had requested for Ban’s advice on the Korea-US summit in late June. Having served two consecutive terms in the international organization’s top post from 2007-2016, Ban is a symbolic figure in the diplomatic sector. He was at one point considered the most plausible presidential candidate representing the then-ruling Saenuri Party earlier this year. “If Ban becomes president, it would be an extension of the Park Geun-hye administration and revival of the Lee Myung-bak government,” Moon had said back then. On the other hand, Ban had accused Moon of flip-flopping over the THAAD deployment and of lacking national security awareness. Amid falling polls and scandals concerning the conservative camp, however, Ban announced he would not be running in the election and left for the United States in April to take a post as visiting professor at Harvard University. He returned Thursday for a short visit to his home country. The fact that Moon reached out to Ban had boosted speculation that the former UN official might play a role in the upcoming summit. The meeting between Moon and Ban came amid disputes this week over the deployment of THAAD. The presidential office recently raised its voice against the Defense Ministry for deliberately omitting reports on four additional THAAD launchers brought into Korea. Though the president strongly underlined that the related investigation would not affect Korea-US ties or national defense policies, the issue had raised tension between the two allies, with less than a month remaining to the summit.